This last Tuesday, I wrote a bit about why you get aches and pains after a hard day at the gym. If you worked out the right way, those aches and pains are a good thing! It’s the way your body tells you that you exerted yourself more than you usually do, and your muscles will start to show results. But sometimes, our body aches for the wrong reasons, and those aches and pains might not be telling you such good things. But how can we tell a good ache from a bad ache? There are many, many bad aches and pains you need to look out for. Many more than can be outlined in a single blog. But I have three big sources of aches and pains that you need to look out for when going to the gym, and are completely preventable. Bad posture is something I have seen throughout gyms, even among professional bodybuilders. We might start off a workout session with the best form possible. But by the end of the session, you might be tempted to lift with your back, instead of your legs. As we get tired, our body naturally tries to take shortcuts to make it easier for ourselves. Like I have said before, think about your body as a river. Instead of moving the boulder, a river will simply flow around it. Thats why when your arms start to get tired from doing push-ups, you might start arching your back. Your body isn’t trying to hurt you – it just doesn’t want to change. When I’m working with a client and I see that their posture starts to slack, I stop that particular workout set immediately. Working out with bad posture is asking for injury, and can be extremely damaging if done over long periods of time. Instead of pushing yourself toward injury, it’s best to stop the exercise and move on to another set of muscles. If you’re working out correctly, you’re going to feel a burn across a wide spectrum of muscles in your body. Every muscle is interconnected and work together to give you your range of motion. So if you’re doing bench presses, you’re going to feel a burn in your arms and your chest. Thats why you should not ignore aches that are in a localized, specific part of your body. For example, if your knees really seem to ache after doing squats, you might need to readjust how you perform the exercise. If you are experiencing pain like this during a workout, stop immediately! You are here to work out your body, not hurt your body. We will readjust your posture, or we will find other ways to work out that set of muscles. Dedication is great, but do not allow yourself to ignore an injury when you go to the gym. Working out on an injured ankle will not only make the ankle worse; you’re going to start feeling pain in your knees, thighs, lower back, and beyond. Because your muscles are interconnected, pain in one part of your body is going to radiate outwards to other parts of your body. Think about it this way: If you injure your big toe, you might think it’s no big deal. It’s just a toe, right? But when you spend some time on a treadmill, you’re going to walk on your foot a bit differently to avoid putting pressure on your toe. That’s going to cause your ankle to roll a bit more, which will add some more pressure to your knee. After 10 minutes, that slight issue of a stubbed toe isn’t going to be that slight any longer. Don’t ignore pain. Recognize it, and treat it before it can get worse. Missing one day at the gym and resting an injury is better than spending 2 bad days at the gym and making it worse. Feeling the burn at the gym is great, but only if it’s the right kind of burn. Make sure you recognize the difference between good aches which are caused by a good workout, and bad aches which are caused by other problems. Make sure you talk to our team of personal trainers so you know how to recognize the difference. Completing a 5k: The Biggest Competition is You! Spring and Summer is a great time to get outside. Despite the rain, overcast skies and even the wind that comes with early spring, we still get some beautiful days outside which give us a taste of summer time. One staple of the warmer season are the multiple marathons, triathlons, and 5ks that make an appearance around the Portland and Vancouver area. Whether it’s for a great cause you believe in, or just because it’s something to do, 5ks are a great way to put your fitness to the test. It’s A Way to Challenge Yourself – When I bring up running a 5k, a lot of clients outright say “I can’t do something like that,” or “I’m not a runner.” But this kind of outlook misses the point of taking part in one of these events. Running in a 5k is about beating your own limits, not about beating the others in the competition. Just by signing up, you’re already beating the prior version of yourself who was so adamant that you could never take part in a 5k. It’s a Tangible Goal – A running event like a 5k as a scheduled start date. It has a measured distance (5 kilometers) and a detailed route, so you know exactly where you’re going to be running. Why is this important? Because when you sign up for a 5k, you know exactly what kind of improvements you will need to make in order to participate in the event. You and I can work on endurance and spend a little extra time on legs. If you’re feeling some extra incentive, you can even practice on the route before the event even happens, so you can anticipate the kind of track you need to practice for. It Gives Measurable Improvements – When you first start training for an event like this, I like to measure where you start off, so you can compare it to where you end up on the day of the 5k. Not only is a 5k event a great way to set goals, it’s also a great way to measure how much improvement you make leading up to the event. Think about it like this: When you sign up for a 5k, you know you have to eventually get up to travelling 5 kilometers at a set pace. That’s a long distance, but we don’t do it all at once. Instead, we make a goal of getting to 1 kilometer, and then we move up from there. Eventually, getting 5 kilometers won’t be so far out of your grasp. Finishing is Better than Never Starting – Whether you sprint, jog, or walk across the finish line, you are still beating the version of yourself who never started. It doesn’t matter to me what pace you take during the 5k, as long as you are pushing yourself to do the best that you can. The pace that you finish only matters to one person: yourself. If you have kept the best pace you can and completed the 5k, you have already beaten your prior time. No one can beat that. Competitng in a 5k really is a no-lose scenario. Most runs in the area are meant to benefit a local organization, like MS research or the Humane Society run. You get a chance to spend some time running outdoors, and most of all, it gives you a goal to work toward. Where can you go wrong? Let me know when you’re ready to take part in a 5k, and we’ll start a timeline to get you ready for the occasion! If you haven’t yet read part one of David’s story you can find it here . David had to take off for surgery, but I advised him to meet with his physical therapist after his surgery. This way he could find out about the strengthening exercises he could do, that he could still do some cardio, and he could also focus on great nutrition. David had the surgery and met with his therapist, as well as getting good nutrition advice from Andrea. Now with the surgery behind him, a great diet to follow, and exercises from his therapist, he took action. David went on to drop another 15 pounds after his surgery. Over the next three months he became a gym rat! It was working for him because he was working it. And don’t think that he just worked out all day. David also had a busy career that included travel and high-level executive commitments, as well as family time. He made sure that working out was at the top of his to-do list each day. He was thrown yet another curveball when he was at the point of making some real progress. A knee doctor told him that at some point his knee would need to be replaced. The pain became too much and he ended up going in for full knee replacement surgery. Following the surgery he again had to meet with doctors and physical therapists, and he made a plan to keep the progress going to strengthen his knee. He continued his mobility exercises and cardio. In fact, he could be seen riding his bike daily with what he called his racing tights (compression pants to keep blood clots form forming and to keep swelling down). He had his headset on listening to the Beatles, eyes were closed, and he was visualizing himself riding in the mountains. Seven months after surgery and he was down to 230 pounds, which was over a 100-pound weight loss! That was such a great day for David and it hit him with a lot of emotions of happiness, gratitude, and fun. He didn’t think it was possible to do, and at first he was just going to hunt and hike better, but the results were even better than he had imagined. David had lowered his blood pressure, reduced his cholesterol, and his doctor was blown away by his results. He had to get new workout clothing, and he would flex his biceps. He liked the tight feeling in his muscles. Plus, when he came back from hiking he showed me a video of him moving effortlessly through the mountains. I can see why he wanted to lose the weight, as the views he saw hiking were beautiful! 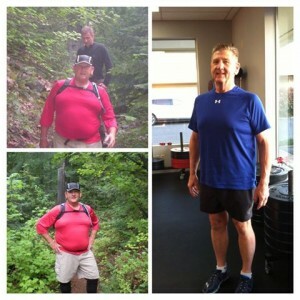 David often gives me credit for his results, because I was the personal trainer who worked with him. He feels that I have done the most good for him with all of the training he has ever gotten. But I have to remind him that it worked because he worked it, and it was a honor to play a role in helping him with that journey. Currently, David is 223 pounds and is at 17 percent body fat, and he still isn’t done. His target is 213 pounds and 13 percent body fat. He’s even looking to remove some of the excess skin as a result of his successful efforts. The best part is that he is in the best shape of his life and with his view of life and physical vitality he views 60 as just the start to life. David’s results may not be typical, but they go to show that transformations like this are possible. Ultimately, you are responsible for your workout effort, eating the right foods, and you should always meet with your doctor before starting a new exercise plan and diet plan. Also, consider working with a personal trainer, such as myself. It may be just the extra motivation you need to help get it all to work this time around! Facebook FAQ Part I – What does this really mean? If you are not yet following me on Facebook, you should be. In addition to the personal training that I provide to those in the Vancouver, Washington area, I also answer questions from people on Facebook. 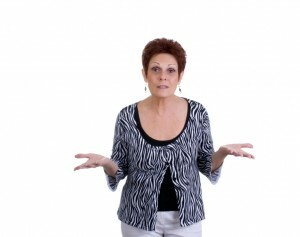 Since I specialize in working with seniors and baby boomers, many of those questions come from them. You may be able to relate to the question what it all really means, anyway. When it comes to cardio, you need to do something that is going to get your heart rate up, such as walking, biking, using the elliptical or stepper, or a row machine. When it comes to mobility exercises, you want to do 10 minutes each day. Yes, do them every single day! You will also want to do strength training 3-4 days per week. Your cardiovascular workouts should be 20-40 minutes per day and you will be doing them 6 days per week. Weight Training – Squats, DB bench press, single arm cable row, single leg RDL, barbell curl, lying tricep extension, super man, V-up. For week 6-8, you will want to do three rounds to bring the rep range down to 10-15 reps. Also, focus on bringing up the intensity. You can do this by increasing the weights that you use, but always consider your form first and foremost. A good rule of thumb is that you if you can’t control the weight or maintain form, then do not increase the weight. If you haven’t worked with a personal trainer it is a good idea to team up with one. That way a workout routine would be developed especially for you. If you are in the Vancouver, Washington area I would be happy to help. If you are not, follow me on Facebook and I can answer your questions there! Check out the next blog post, where I will go more into depth about what your plan should include. 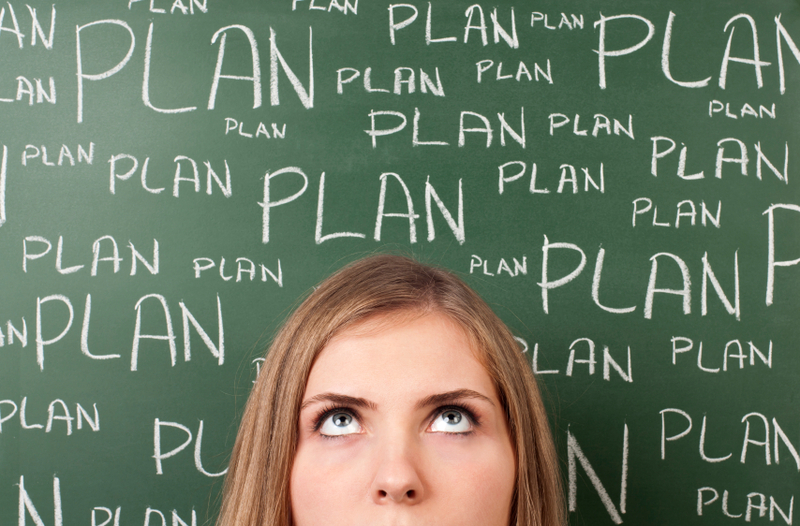 Get a Plan – Or Make One! Do you have a plan for remaining healthy, fit, and on your path to weight loss? If you don’t you may find the holidays a bit more challenging to get through. It’s so important that you have a plan to get through this month. I know, you may be thinking this is a bit dramatic, but it’s not. The more prepared you are for this month; the more likely you will be successful at making it through without weight gain! The holiday month is a time when many people, including some of my personal training clients here in Vancouver, Washington, gain weight. Nobody sets out to gain weight during the holidays, but it happens. With all the aromas of cookies, candies, and foods, we may only see this time of year as difficult time for to maintain a healthy lifestyle. It’s understandable, but there is something you can do to beat it. It’s call having a plan. If you don’t already have one, now is the time to get busy creating one. Set goals. You must have a goal of what you want to accomplish through the holidays. Do you want to not gain weight? Lose 5 pounds? Whatever it is you need to write those goals down. Make them specific and get them on paper now. Get a trainer. Work with a personal trainer, such as myself. Our job is to help keep you on track, motivated, and working toward reaching your goals. If you are in the Vancouver, Washington area, contact me. If you are not, find a personal trainer to work with in your area. Write it down. Buy a journal and every morning write down the things that you have succeeded at. Include even the small things, so you have a record of all the successes you have had along the way. Find quotes. Find some motivational quotes online that will keep you inspired and on track. Print a few off and put them on your mirror, refrigerator, and even keep one in your car. This will be a good focal point when you are in need of some encouraging words. Call a friend. If you know someone else who wants to make it through the holiday healthily, become health buddies. Agree to call each other daily this month and discuss challenges, successes, and plans. Follow me. If you are not already doing so, follow me on Facebook. I regularly post things that are motivational and inspiring, which will help keep you on track. 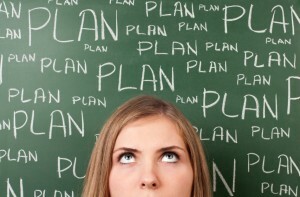 Having a plan is a big key to making it through the holidays successfully. It will help keep you from gaining the holiday weight that so many do, but it will also keep you fit and even on track for losing weight if you are trying to. This holiday season it is all in your hands and you have a choice to make. If you want to make it a healthy holiday, get a plan in action and keep at it all month! This past week there was something really inspirational that was on the news. You may have been one of the millions that saw it as I did. I’m talking about Diana Nyad and how she accomplished a goal at the age of 64. For those who feel that you reach a point where it is too late to reach for your dreams, she serves as an example that it is never too late! Nyad was big news this past week because she did something that nobody else has done before. She swam the 110 miles from Cuba to Florida without a shark cage. Did you get that? At the age of 64, she swam 110 miles in order to set a record. She’s the first person to do this and yet she’s a baby boomer. No protection from the elements, bitten numerous times by jellyfish, and hungry, she finished the goal she set out to do. Her message to people is that they should never give up. She didn’t, and neither should anyone else. She also demonstrated that you are never too old to chase your dreams. You only have one life to live, making it crucial that you go after that which you dream of. She had a dream of making that swim and she did not let her age become a barrier to her achieving her goal. Another one of her messages is that many things in life, such as what she accomplished, is not a solitary act. While she gets the credit for the swim, she actually had a team of people who were providing her the support in order to make it possible. While Nyad had a team of 35 people, some people need merely to work with a personal trainer or coach in order to reach their goals. Many people don’t realize it, but we are often the biggest obstacles we face when wanting to achieve something. We have a goal in mind, but we talk ourselves out even going for it with piles of excuses. We place limits on ourselves that don’t need to be there. The negative self talk that floats around in the heads of most people, including my personal training clients, has probably stopped you from achieving many goals. You have to believe in yourself and in your ability to accomplish things in order for it to become a reality. Perhaps you are reading this and your own dream comes to mind. Maybe it has nothing to do with fitness, but rather with finances or business. Your dream may have been something more related to personal issues, spirituality, or romance. It’s never too late. Whatever your dream was is still waiting for you. You may think that at your age you have lost the ability to achieve that dream. You may think you are too old now. But let me remind you that a 64 year old woman just swam 110 miles in shark and jellyfish infested waters in order to make her dreams a reality. She did it in 53 hours, after she had failed at attempting it on three other prior occasions. So what is your dream? What’s stopping you from going after it? Forget the excuses. Instead, put a plan into action and make it happen. You can do it. I believe in you and you will achieve your goals! If you have ever had a problem with balance you know how serious it can be. In fact, it is estimated by the Centers for Disease Control and Prevention that a third of all adults over the age of 65 fall each year. These falls can lead to serious problems, including hip fractures. Focusing on one’s balance is a good way to help lower the risks of these falls. The risk of falls aside, not having good balance can do numerous other things as well. It can make it more difficult to walk upstairs, get up out of a chair, bend over without getting dizzy, and just being able to walk steadily. Balance is what keeps you safer, as well as feeling better as you move around. It is important to exercise regularly. This exercise needs to be on your feet. What this means is that you should get out from those machines that have you sitting down. If you are sitting on an exercise bike you are not doing anything to help your balance. Choose exercises that will get you standing up and moving around, such as using the treadmill. Also, consider taking Tai Chi. It is a mild form of martial art that has worked wonders in helping people to improve their balance. Doing unilateral movements, those which have you use just one side of the body at a time, can also help improve balance. There are various squats and leg lefts that you can do to make balance improvements. You may have been shying away from them before, but now is the time to get to know free weights. By using free weights you will strength train and improve your balance. If you are unsure which ones to do always work with a personal trainer who can develop a plan specifically for meeting your goals. My Vancouver, Washington baby boomer clients benefit from better balance as a result of the personal workout plan that I create for them. Whether you are in my local area or beyond, make it a priority to work on your balance. 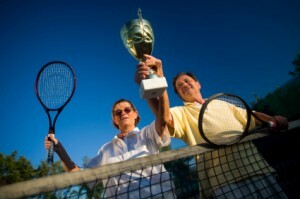 The benefits are long lasting and important for every baby boomer! Do you have difficulty walking up the steps? What about making dinner? If you find these things a lot more difficult than you used to it is time to take action. Believe it or not, you can get your strength back, even as a baby boomer. You do not have to take a loss of strength sitting down. Now is the time to stand up and fight… now is the time to dig in! As a personal trainer in Vancouver, Washington who helps numerous baby boomers I address the strength issue on a regular basis. Yes, it’s true that if you do not work at it you will lose strength as you age. In fact, you will lose about 30 percent of your strength in the years that follow turning 50 years old. But it doesn’t have to be that way. You can get that strength back, but it takes you being proactive in making it happen. Many people think that you only hit the gym and lift weights if you want to be a body builder. Not so! The strength training that you will do in the gym will help you be able to climb those stairs better, or make it easier to tackle making dinner. You can use free weights, elastic bands, or exercise machines. The key is to have some resistance, because that resistance is going to help you build and maintain your muscle mass. Make sure you start with mobility. Without first focusing on improving your mobility you will find it difficult to take on the next step of strength training. Once you have addressed the mobility issue you are ready to move on. Get a program to help you increase your strength level. The key here is that you have to make sure it is focusing on your weak areas. If you cannot identify them work with a personal trainer so you get the results you are after. Use a progressive overload approach, which will keep your body from bulking up or getting bigger. Instead, you will set goals of getting stronger and focus on meeting them. Take action. This is the most important part. You can talk all day long about what needs to be done and why, but it will be worthless if it is not put into action. If you want to see results you must get a program and put it into action. Getting older does not have to mean getting weaker. You can stop the loss of muscle and gain some strength back again. But you have to be proactive in making it happen. Whether you work with me, through my Vancouver, Washington personal training for baby boomers, or you do it with someone else, your strength training goals can be achieved. They also make a big difference in your quality of life, making them a goal worth fighting for! Mobility is not something one thinks about all that often. At least, that is, until it begins to decrease over the years. Once you can no longer do the things you used to do as easily, you may begin to think about mobility issues. The good news is that there are things you can do to improve your mobility, regardless of your age. As a personal trainer that specializes in working with baby boomers and senior citizens, I have witnessed the way being proactive can help people improve mobility. There are numerous things that can impact your mobility, including arthritis, slowing reflexes, a decrease in the ability to stretch or bend, loss of bone tissue, and more. The loss of mobility is especially problematic for baby boomers because it can not only hinder your ability to do the things you love, but it can also lead to you losing some independence. If you are a baby boomer who wants to stay independent and continue doing things for yourself it’s time to get serious about improving your mobility. Make it daily. Working on improving your mobility is not something you can do once in a while and then expect to see results. Rather, you have to make a commitment to improving it and then being proactive to get there. You have to work on mobility exercises on a daily basis. This includes getting daily exercise, stretching, and living a healthy lifestyle. Try different methods. Stretching is a good way to help improve mobility. But you also need to know the right kind of stretches you should be doing (which is why you should be working with a personal trainer). However, if you feel stretching is not doing enough for you, try something else. Other methods to try are to include using a foam roller, getting massages, art, structural integration, tennis ball rolling, and partner stretching. There are many different methods to try, so there is a good chance you will find one that is going to help you improve your mobility. Test and test again. It is important to know if your efforts are working. To do this, take a pre-test before you get started with the mobility exercise plan. Then, test as you go in order to see if you are gaining motion. If you are, great, then it is working as planned. If you are not, then you may need to try another method in order to get better results. Take action. The best way to take action is to meet with a personal trainer, such as myself on a weekly basis. When you do that you will get a plan that will work for you, the results will be tested, and you will see and feel the difference it makes. 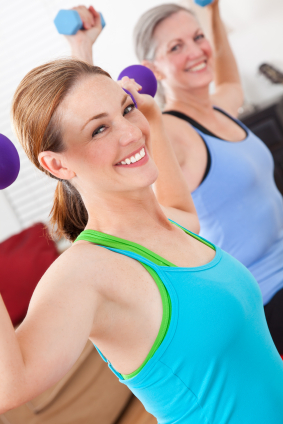 A personal trainer will help identify weak areas and exercises to strengthen them. If you are feeling down about a loss of mobility it is important to understand that it doesn’t have to stay like that. You can take measures to help make improvements. But if you ignore it, the problem will get worse and it will keep you from being as happy. Take the steps now to make improvements. Before you know it you will have improved your mobility and will be feeling great. If you are in the Vancouver, Washington area I will look forward to hearing from you. If you are not, seek out a personal trainer that specializes in working with baby boomers or senior citizens, so that you get the best possible results. Q. Boomer Fitness – I’m hoping you can help me out with something. I work out at a gym that has an indoor pool. I noticed that the schedule they have offers some senior water aerobic classes. I stopped in and watched for a few minutes and although it looks like a fun time in the water, I wonder if people are actually getting a good workout. What do you think? A. What a great question, thank you for asking it! This is a question that I have had from many senior citizens over the years. Baby boomers see the water aerobic classes going on and want to suit up and take a dive. Yet there is a little hesitation in doing so. Maybe it’s because they don’t see people that are in the classes sweating. Even if you can’t see people sweating in the water aerobics classes there is a good chance they are doing some good for their body. One of the main reasons that senior citizens opt for water aerobic classes is that it is easy on the joints. If you ever suffer from joint pain you know that it can make keeping up with your workouts challenging. Yet most people who do water aerobics find that there isn’t any pain. While I may not rank water aerobics as the best possible way for a senior to get in a workout, I do think that it’s an acceptable option. This is because it gets you working out. I’m much more concerned with people working out regularly, rather than what it is that they are doing to get that work out. You mentioned that you thought the water aerobics class looked like fun. Well I can tell you from working with many baby boomers that when something is fun you are more likely to continue doing it. Fun workouts make time go by faster and you will forget that you are actually doing some hard work. My suggestion would be to give it a try. Unless you suffer from the ongoing joint pain I would not suggest that you make it your sole form of exercise, because it’s good to change it up some. But doing it once or twice a week, especially if you find it to be fun, is a great thing. You will burn some calories, have some fun, and go easy on the joints. If you feel you need a little something more, take a few laps in the pool before or after the water aerobics class. So, suit up, jump in, and have fun! Too Busy For Exercise? Or Too Busy For Life? Please note that all times are subject to change due to events, holidays, and weather. Visit the Boomer Fitness Facebook Fan Page for the latest updates! Copyright © 2017 Boomer Fitness. All Rights Reserved. Simply enter your email below to be entered to win a 6-Month Membership at Boomer Fitness.